We've moved to a more reliable pop-up free web host! Its best to type type it into the address bar to link to the new site. Located in a small remote town north of Jacksonville, Florida, a short distance off I-95 is the busy railroad town of Folkston, GA. Folkston is one of 5 Georgia towns that welcomes railfans. With an idea borrowed from the Rochelle (IL) Railroad Park, Folkston built their own. 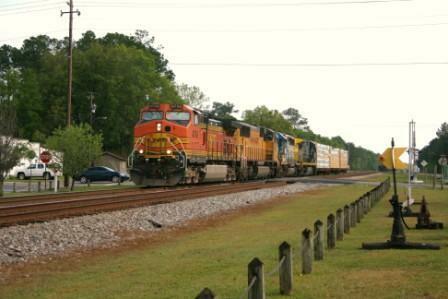 Located on a double track mainline of CSX, 90% of all trains to / from Florida pass through Folkston. On the east side of the tracks you have the traditional railfan park, which includes a viewing platform (with radio scanner, and lights), restrooms, and parking lot complete with a well groomed lawn along the tracks which really adds to the peaceful enviorment. On the westside of the tracks is the old train station building which is used by the chamber of commerance. Picnic tables and another well maintained lawn is perfect for train watching when the sun moves to the west side of the tracks. At night, flood lights illuminate the tracks for nighttime train watching. Amtrak also passes Folkston 8 time a day (but they do not stop). Some of the daily highlights include the Amtrak Auto-Train, and the Tropicanna Orange Juice train (operated by CSX). 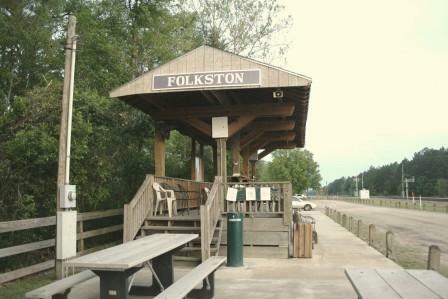 Folkston is one of the top train-watching spot in Georgia. Rail Traffic: Expect 40 to 45 trains during a 24-hour period. Site Details: A complete train-watching park. Includes viewing platform with radio scanner & lights, areas to watch trains from both sides of the tracks. Restrooms on site: Yes. (New restroom facility). Food: Not on site, but a short drive to McDonalds, or a few other places to buy food. Picnic Area: Yes, with grill. Parking: Free Parking, trains can be viewed from the comfort of your automobile. Lighted for evening rail fanning: Yes, lighted parking area plus flood lights illuminating the tracks. for excellent night-time train-watching. Motels / Hotels: Folkston has limited lodging. There are no chain-operated motels in town, but a small group to choose from. The Roadmasters Lodge offers a railroad view, and will soon be listed on RailfanMotel.com website. Kingsland, GA, located on I-95 has a number of motels to choose from. Kingsland is 20 miles east of Folkston, expect about a half hours driving time. The viewing platform at the Folkston Funnel, it's not often that you can get this picture with nobody present. 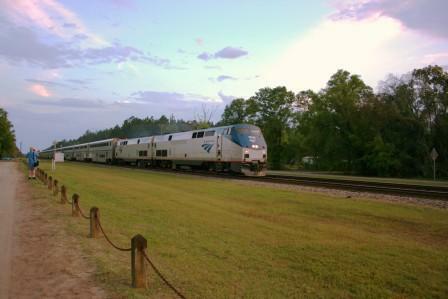 A northbound Amtrak train passes the the train viewing park in Folkston. The Amtrak trains do a good 60mph as they pass Folkston. 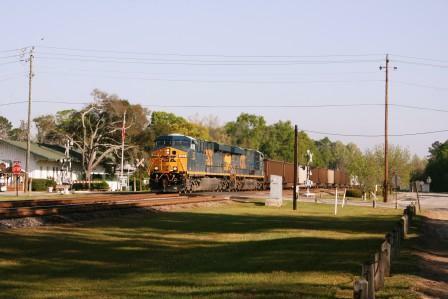 A southbound CSX freight passes the Folkston train station building (seen to the left of the train). Fans can photograph or watch trains from both sides of the tracks. I took this shot from in front of the viewing platform. Foreign locomotives can be seen almost daily in Folkston, witness as a BNSF, Union Pacific and two CSX units pass northbound with a 3 car train. Actually, the crew went to place these 3 cars at a customer, then will return to their 70 car train which they left on the main south of town to avoid blocking the several grade crossings in town.